On a quiet Sunday morning, Ella receives an unexpected visit from Helga, a woman she has never met before. Both their lives have been affected by the same Nazi-SS officer. Helga has a mission, and Ella has a secret. Cast Breakdown: 2 Women in their mid-50's. Ella's Secret was staged for the first time in Seattle in 1998 at the Ethnic Cultural Centre Theatre, University Washington. The performances were co-sponsored by The International Conference on the Holocaust and the Churches, the Ethnic Cultural Centre of the University of Washington and Yad Vashem. Among those attending the performances were representatives of Simon Wiesenthal Centre, and Goethe House. This was an inter-faith and inter-ethnic event. We mounted the play at the invitation of the Chairman of the Conference who was an African-American Clergyman and Professor at the University and one of the founders of the organisation. One of the performances was also sponsored by The Social Justice Committee of the Christian Church (Disciples of Christ), Northwest Region for an audience of Christian high school students, and I lead an informal discussion of the play with them after the performance. More recently, in July 2015, the play was successfully presented in London at the Baron's Court Theatre. In both 2012 and 2013 the play was presented in Italy in Italian in Rome and at the Spoleto Fringe Festival to critical acclaim. 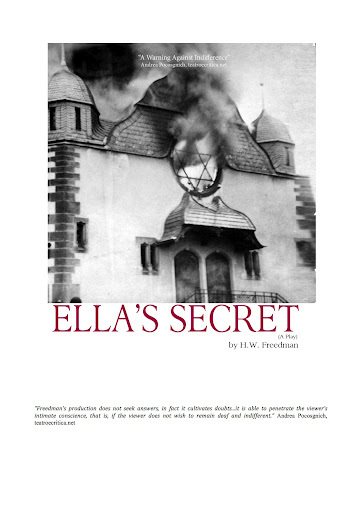 In November 2018 Ella's Secret will be presented in Prague, Czech Republic in the Czech language.